John Takami Morita has been working on a series of photographs, etchings, and photo etchings on the San Francisco Charles Ware Family from 1972 to 1990. He continued photographing this family, and then added video to his project 11 years ago. 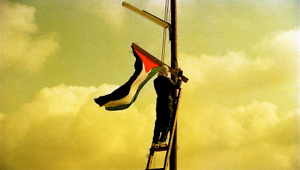 Mr. Morita’s second print/photography series addresses The Palestinian First Intifada. He was invited to participate in three human rights tours to Israel and the Occupied Palestinian Territories in 1986, 87, and 89 by Palestinian groups in Chicago, and New York . There are also, several large funeral photo etchings of Mr. Morita’s family and relatives in Hawaii, and Japan. The other large prints were based on the photographs of Ryuichi Hirokawa, who was the first photographer in 1982 who took pictures of the massacre of Palestinian refugees in the Sabra and Shatilla Camps in Beruit Lebanon. Mr. Hirokawa asked John Morita if he wanted to use his photographs of Sabra and Shatilla for his art work.